Mercedes' Lewis Hamilton celebrates after winning the World Championship. 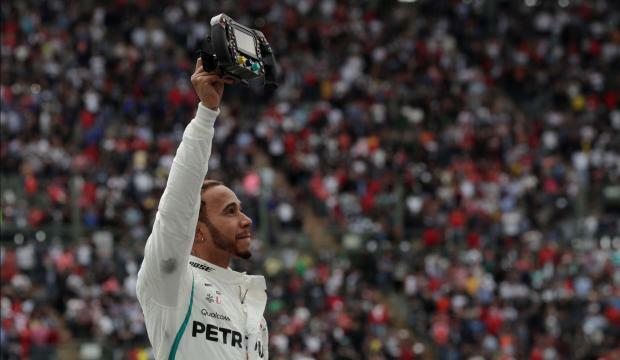 Lewis Hamilton won his fifth Formula One world championship in Mexico on Sunday. 2007, with McLaren. He finished third. and 2014, 2015, 2017 and 2018 with Mercedes. 11 - Most wins in a single season (in 2014). 16 - Successive podium finishes (2014/15). 22 - Hamilton's age when he made his debut. Vettel, who won the 2010 title aged 23 and 134 days. that ended with retirement in Austria in June 2018. 50 - wins for Mercedes since he joined in 2013.
in Canada in June, 2007. 132 - Hamilton has finished on the podium 132 times. at least one race in every season he has competed.